In order to become safe, responsible drivers, a full drivers education course is required. At A-Alert Driving School, we provide you with all the necessary tools to become a good driver. Classes meet April 29th -May 22nd, 2019, Monday through Thursday( , from 3:00pm - 5:00pm at Hartford Union High School in Room 151. We must receive signed contract for student to be registered, Go to Driving resources, print contract, and then register student. Classes meet June 10th - June 28th, 2019, Monday through Friday , from 11:45am-1:45pm at West Bend High School in Room G90. We must receive signed contract for student to be registered, Go to Driving resources first and print contract, then register student. Classes meet July 8th Through July 31st, 2019, Monday through Thursday, from 11:30am - 1:30pm at Hartford Union High School in Room 151. We must receive signed contract for student to be registered, Go to Driving resources, print contract, and then register student. 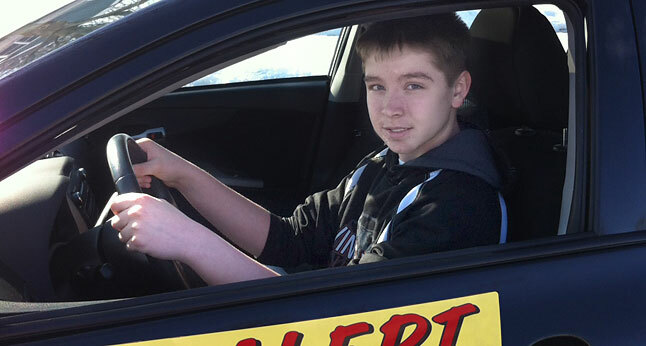 Send your teen to a driving school that you can trust. A-Alert has an established policy of offering the public the most advanced and comprehensive driver training available. *** NEW Price begining 12-28-17 $350 for Wisconsin Online Classroom and 6 hours behind the wheel with 6 hours observation. WE ARE USING A NEW IMPROVED ONLINE PROGRAM. Wisconsin has passed bills allowing commercial driving schools to provide online driver education as of June 1, 2016. Students under the age of 18 who have busy schedules and can not fit the full 30 hour classroom session into their schedules or prefer learning online verses in class, this option has been approved by the state of WI and is now available to you. Students over the age of 18 will also be able to register for this online classroom course if they wish to do so but it is not mandated by the state. A-Alert Driving online driver education course meets the state required 30 hours of classroom instruction for students under the age of 18. A chapter/unit test must be passed at 80% or better prior to proceeding to the next unit. To enroll in the Online + BTW option, simply go to Drivers Ed services and choose the online course click on register, fill in the student information page and follow the on screen prompts. Once we receive the deposit for the course and the Registration Contract (found under Driving Resources), we will issue you a link to access the online course, We will not issue this until we receive contract and payment. The online course must be completed within 4 months.